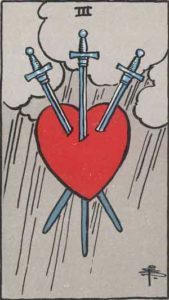 Today’s card is the Eight of Swords. 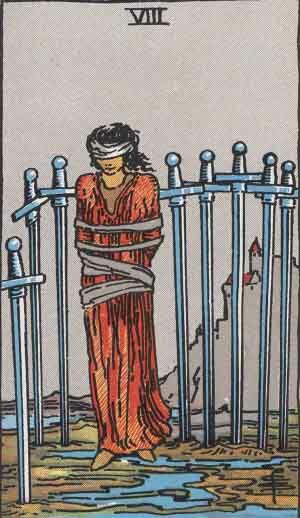 A person is bound, blindfolded, and trapped between eight swords. To move in any direction is to risk being sliced apart. However, their situation is not as dire as it seems: their bindings are already beginning to slip off of their body. 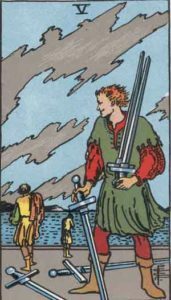 A dour card in a suit that only gets worse, the Eight of Swords signifies that you are in a situation where moving in any direction will just make things worse. Though it’s the most frustrating kind of position to be in, sometimes doing nothing is the best course of action. Our subject in the card is in quite the spot, but time will give them the help they need most. With patience, they will be freed from their predicament – but they must be patient. 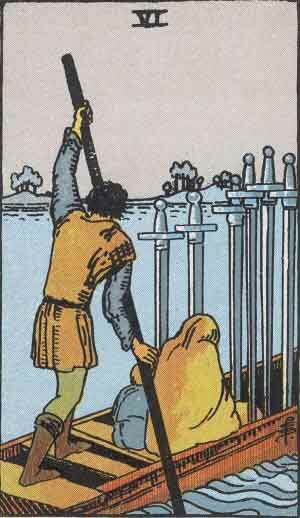 Today’s card is the Seven of Swords. Another poor card! 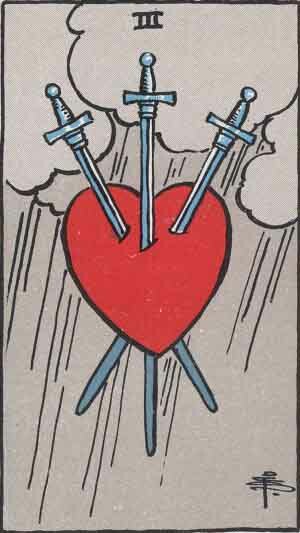 The Seven of Swords is a card of treachery. A man is seen running away from an encampment, clearly in the act of stealing swords. Five of the swords are in his arms, while the other two have fallen, stuck into the ground. 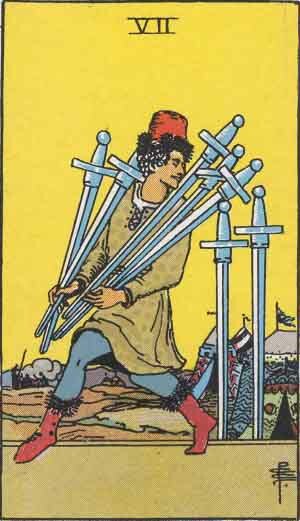 Seeing the Seven of Swords, typically, is a pretty bad sign. You’re right away put on your toes about the people around you – who’s going to stab me in the back? Who’s working against me in secret? 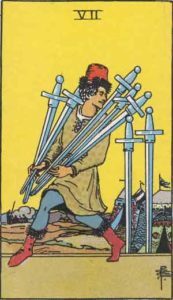 But worst of all is when YOU are the focus of the Seven of Swords. Figuring out you’ve been running away from your responsibilities and letting people down is one of the harshest feelings in the world. Of course, like any card, it’s not all bad. Sometimes the best thing to do in a situation is pack up and run as fast as you can, before you get brought down by the others. And who can blame a guy with such fashion sense? Look at that fez and those fur-lined boots! Today’s card is the Ace of Swords. The Ace of Swords, like the other four minor aces, shows a hand emanating from a cloud holding the icon of the suit. The sword in this card is crested with a crown, and is surrounded by mysterious flames. 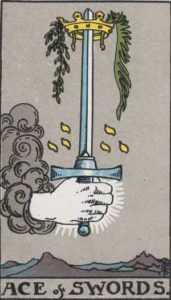 The Ace of Swords represents the ultimate “cutting” action. It demands direct, forthright action – cutting through all obstacles, slicing through all potential struggles, and shattering anything that gets in your way. 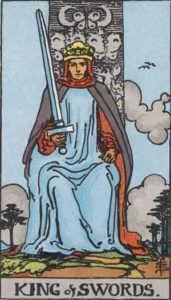 With the Ace of Swords, expect a sudden and surprising ability to get what you want. 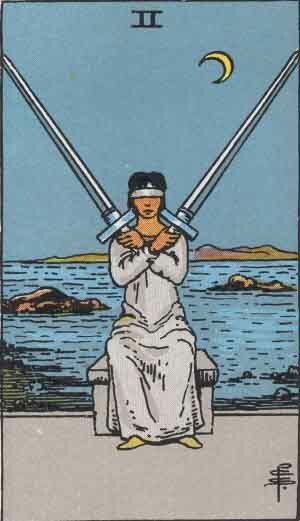 Today’s card is the Two of Swords. 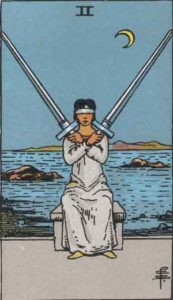 The Two of Swords features a person blindfolded and holding two swords before them. 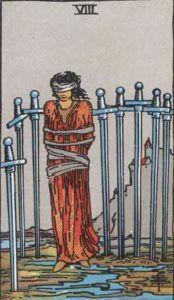 They are blind, but not helpless – though they cannot see any potential assailants their two swords keep them well defended. When drawing the Two of Swords, you feel on guard in your life. The stresses and troubles of everyday life have been getting to you, and you feel like your back is against the wall. Don’t fret – though things seem like they’re stacked against you, you’ve got the tools you need to overcome.